Do you know that moment when you wake up, but you're not really awake? It's almost like you're a computer booting up - first your hard drive starts 'waking up' and your monitor is really the last thing to turn on? This morning, my brain woke up before my eyes even opened. It's very strange. You can hear your surroundings. You start your day before opening your eyes or even removing the sleep from them. I started my day thinking about my upcoming job. Being that I have no idea what to expect, I've been assuming a lot. Everyone knows I'm pretty nervous. But everyone also knows that I'm pretty excited. I have a job! Not just any job - but a paying job that makes a difference. Sure, I've been a stay-at-home mom for the past ten years and I wouldn't trade it for the world, but this is an opportunity to affect the world around me instead of my immediate circle of influence. Sure, serving the kiddos at the preschool their daily grindage is important but how much of a daily, lasting impact do I make doing it? I figure not very much. To work so intimately with students in a classroom environment is very exciting to me! Someone suggested that it's hard not to get attached. I'm almost certain that I'll get attached. It comes with the territory, don't you think? Thinking about all of this brought me back to how I live my life. Thinking back to the past ten years, I know I've made a lot of mistakes as a wife and a mother. In fact, I'm sure there are times when The Man Beast and the Kiddos have prayed that God would have given me a practice family to make my mistakes on and moved on to them once I was perfect. Well, I'm 100% positive I'll never be perfect. I wasn't born the perfect wife and mother. Sometimes, I wish I was. I think of these past 11 years of marriage as Boot Camp. 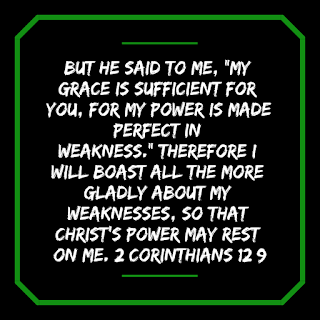 But as my Scripture passage on my blog (at the tippy top if you've missed it), God's grace is made perfect in my weakness. God's grace is top notch in this lady's life, let me tell you! But it's reassuring, too, that I don't have to be perfect. I don't have to have it all together in order for God to work in my life. You don't have to be perfect, either. You don't have to be good enough or earn Our Father's love. It's there for the taking - just as you are. God meets you where you are. He doesn't wait until you've reached a place where you're worthy of His grace and His love. Right here. Right now. That's where God reaches us. Chew on that a bit, will you? For You are who You are no matter where I am. Life on this side of heaven is uncertain. It's sad. It's heartbreaking. It's disappointing. But He is the constant in our ever-changing world. That alone is my comfort and my peace. I'm not sure why I chose to blog on this subject. According to my schedule, I should be talking about my cleaning, decluttering and unpacking (all of which I will be doing today). But I felt moved to talk about this, so I did. Maybe one of you need to read this? Maybe I just needed to read my own words to be reassured for what's coming. What ever the reason it's here, I pray it blesses you.